There are very few manufacturers that actually produce hunting golf carts that hunters may find useful. 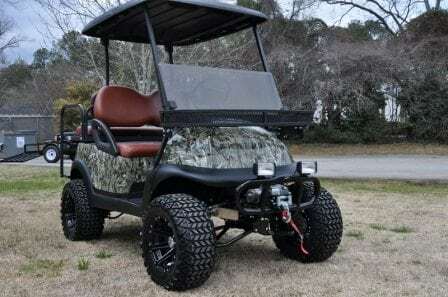 However, you don’t need to purchase a manufactured hunting golf cart because there are a variety of customized parts available to turn any old golf cart into a hunting vehicle. Since hunting golf carts are hard to find and there are only a few options available, purchasing a normal cart and converting it is an attractive option for many. As was mentioned, there are really only two companies that currently manufacture hunting golf carts that are reliable and work well for hunting. The first company is EZ-GO and they offer three different models (Express, Custom and ST Sport) that are appropriate for hunting. The second company is called ParCar and they manufacture a couple of different models that hunters may find suitable. However, even their best carts aren’t necessarily hunting carts and they are most suited for landscape maintenance. The basic idea that sets these carts apart from their counterparts is they are built with lifted suspensions and have tires that can handle off-road terrain. The problem that many have run into is that none of these golf carts offer much torque or enough storage for hunting larger wildlife. Nothing larger than perhaps a whitetail deer can fit on the back. Golf cart manufacturers have only just recently started providing extra custom parts for those that want to modify their carts for hunting. Such parts can include things like more powerful motors, rain flaps, suspension lift kits and cargo beds. Most hunters on a tight budget opt for this solution as any used or already owned golf cart can easily be converted into a hunting cart. This eliminates the need to purchase a golf cart specifically manufactured for hunting needs. This means you could pay much less for turning an old used cart into one that you could use for hunting wildlife. On the plus side, a cart with customized parts will work for your hunting style and not just look great. Modified parts and accessories can help turn a simple golf cart into the perfect hunting vehicle. As a hunter, some of the accessories you should consider are battery-range extenders, oversize tires, suspension lift kits, winches and a higher performance motor. Of course, no hunting golf carts should be complete without camouflage paint, rain flaps, a roomy cargo bed and a gun rack. There are other luxury items that may interest you as well such as air conditioning, stereos or even solar battery chargers. Ultimately, the accessories and extras you build into your golf cart will depend on your budget and the type of hunting you’re looking to do. As with any other type of vehicle, it is important to keep your hunting carts looking great and in good shape to prolong its life. When not in use, make sure you fill the batteries with distilled water and do a thorough check of the suspension to ensure there are no weak spots or damage. You should also check the cart’s brakes often to ensure they’re working properly. The chassis should also be lubricated as necessary, and this is especially something you need to do if you have fitted your cart with oversize tires. As with any other type of vehicle, it is important to keep your hunting carts looking great and in good shape to prolong its life. When not in use, make sure you fill the batteries with distilled water and do a thorough check of the suspension to ensure there are no weak spots or damage.As you can see, there are quite a few things to keep in mind when it comes to hunting golf carts. You can purchase one from the manufacturer or customize your own to fit your needs. Whichever option you choose, you are sure to have a good time!